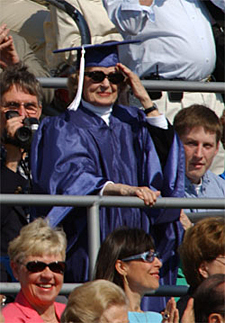 11:22 a.m., July 12, 2010----Kathleen Cross Cooper, who at age 88 was the oldest student in her graduating class at the University of Delaware's 2002 Commencement, died June 30. She was 96. Mrs. Cooper, an artist who studied with Carolyn Wyeth, always wanted to attend college, she said in a 2002 interview with UDaily, but she graduated from high school during the Great Depression and couldn't afford to continue her education at that time. She married and raised her children, then returned to school to earn her registered nurse credentials at the Wilmington School of Nursing in 1979. Later, despite health problems including severe rheumatoid arthritis, she enrolled at UD as an art major to fulfill her lifelong goal. In 2001, after undergoing two surgeries, she continued her studies for one semester via distance learning, then returned to campus to complete her degree. Mrs. Cooper is survived by her sons, Wayne of Lewes, Del., and Francis Jr. of West Chester, Pa.; three grandchildren; four step-grandchildren; seven great-grandchildren; and a great-great-granddaughter. She was preceded in death by her husband, Francis Cooper; her daughter, Gay Retiz; and a grandson, Roland Cooper.